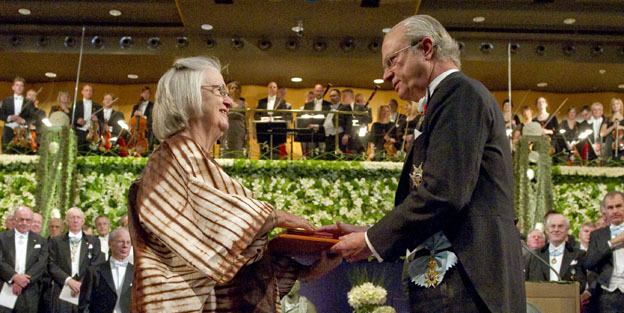 Elinor Ostrom receives the Nobel Prize in Economics from King Carl XVI Gustaf of Sweden during the awards ceremony in Stockholm in December 2009. The “tragedy of the commons” — the theory that a shared resource will be inevitably overused without government intervention, as Planet Money puts it — was widely-held as a fundamental paradox of modern economics and ecology. Elinor Ostrom changed all that. Ostrom, 78, died of pancreatic cancer Tuesday at a Bloomington hospital after five decades on the Indiana University faculty. She was famous for challenging an idea known as the tragedy of the commons — the theory that, in the absence of government intervention, people will inevitably overuse a shared resource. So, for example, if a village shares a pasture, it’s in the individual interest of each farmer to graze his cattle as much as possible on the pasture even though, in the long run, overgrazing may ruin the pasture for everyone. 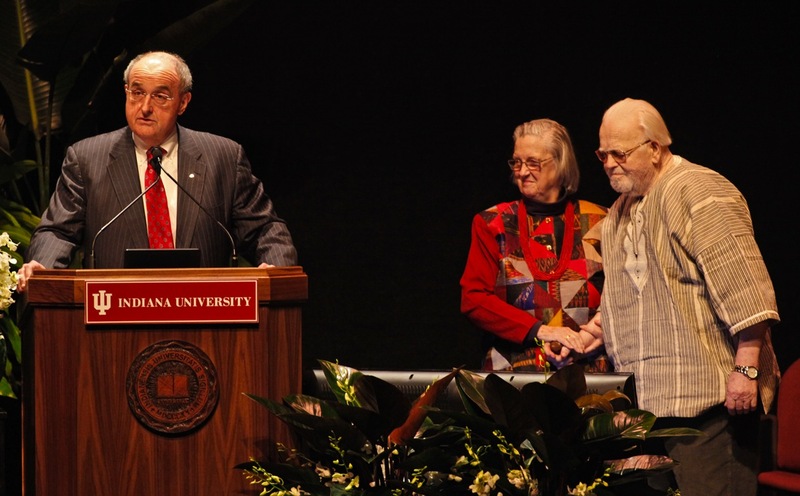 IU president Michael McRobbie (left) awards professors Elinor & Vincent Ostrom with the University Medal in February 2010. To mount her challenge to the tragedy of the commons, “Lin” — as she was known — crossed over boundaries separating academic disciplines. Though a political scientist by training, Ostrom’s is remembered for contributions to economics, anthropology and even fisheries management. Nowadays, interdisciplinarity is the catch word. But when Lin started, it was not a possibility. She never let boundaries define the questions. She never let any kind of boundary define the questions. Not disciplinary boundaries, not geographical boundaries — no boundaries. She never let the way in which academics traditionally define things, define her. As a result, she did brilliant work. Colleague Burney Fischer agreed with Robel’s characterization in an interview with Indiana Public Media. “People talk about collaborative research, the National Science Foundation tries to encourage it. She’s been doing it for 30 years. So in many years, she’s so far ahead of everybody else in terms of thinking that way,” Fischer says. Indiana University announced Tuesday the research workshop Ostrom and her husband founded in 1973 has been renamed in their honor.